Who created the mosaic backsplash and where can I buy it? Hi to all, i would not recommend you using mosaic in oily place, even we are a mosaic supplier, because it may looks good but after for a while its a little bit hard to clean up grouts. And sometimes you need to renew the grouts. Would you advise manufacturer of gas cooktop and wall ovens? It is definitely a Dacor cooktop. I have one and love it. What is the color on the walls? Or is it a technique? It is indeed a plaster technique by a talented faux finisher. What is the stain on the cabinets? Grapes have been a recurring motif in kitchen designs since Roman times, and when they're rendered in stone they pay homage to that pedigree. 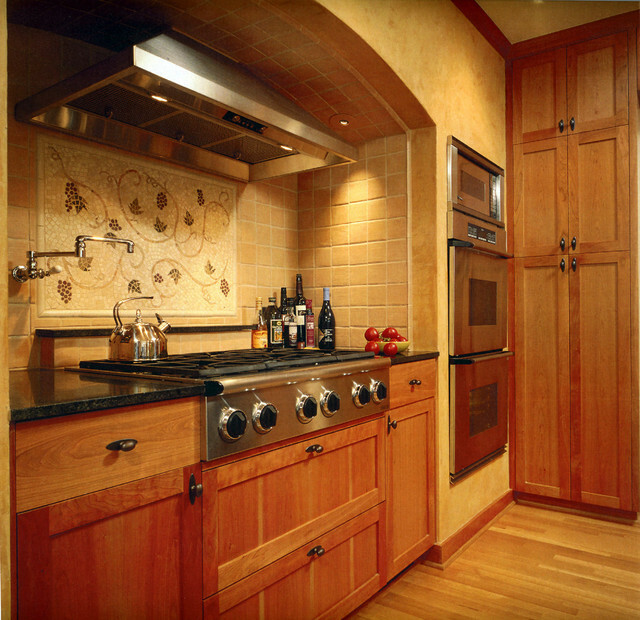 This cooking alcove has an artful feel that doesn't tie it to any particular style or time. Frame a mosaic mural or pattern. This grapevine design was created from intricate pieces of stone mosaic tile. New Ravenna is the Tiffany of the tile mosaic world. Double ovens next to cooktop with wall arch above. Dacor cooktop looks like a great choice.